The Script Doctor: Is House, MD for real? How real? starring Golden Globe winner Hugh Laurie. 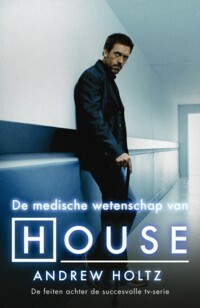 Week after week, House, M.D. has held viewers' attention with brilliant cast performances and intriguing diagnostic mysteries often solved with daring treatments. But how much of the medical detail is real and how much is fabricated? In The Medical Science of House, M.D., Andrew Holtz, a well-known medical journalist, reveals how medical detectives work - how they follow symptoms to their source. * How can a teenager adopted at birth nearly die because his biological mother didn't get a vaccine? * How can a husband's faith in his wife's fidelity determine whether radical treatment will cure her or kill her? * How can a missed eye-doctor appointment reveal a genetic disease? * How can doctors choose the right course for a pregnant woman when one may kill her and the other would abort her fetus? and the hospital backdrop of the show. * Would you want House to treat you or a loved one? * What would happen to a doctor like House in a real hospital? * Where are all the nurses, lab techs, and radiologists? * What could medicine learn from the airlines? I'm a veterinarian but I watch the show because I have some inclination to Medical Science Mystery but I think that the all show is fiction and that things are exaggerated or altered to suit the story but its change the vision or the meaning of and the ways to reach the diagnosis to me as a doctor -as a case we must take History with environmental issue then physical examination then the Laboratory thing to finally narrow the DDFx to reach the right diagnosis. On the other hand, I didn't see a diagnostic book explain and show how to reach a diagnosis in Human medicine but we have in Vet medicine So, its very nice to see this in TV Show like HOUSE MD.